The main elements commonly considered medically active are flowers and leaves of the plant. Flavonoids: 3-rhamnoglucoside, 3-glucosideand, spinacetin, 3-glucoside, quercitin and so on. Plant’s root contains acetylenes: Cl3 and Cl4 trans-spiroketalenol ethers, trans-dehydromatricaria ester, and so on. Phenolic acids: chlorogenic, p-coumaric, syringic, vanillic, protocatechuic, p-hydroxyphenylacetic acids and so on. Volatile oil which includes several components, of which the main one (over 35% of total stock) is thujone of a- and b- type, followed by azulenes (not without chamazulene), thujyl alcohol, bisabolene, phellandrene, pinene, trans-sabinylacetate, 3,6- and 5,6- dihydrochamazulene, camphene, cadinene, sabinene, and so on. Sesquiterpene bitter components: anab. Sinthine, matricine, artabsine, and absinthine. Sesquiterpene lactones: artemolin, artabsin, isoabsinthin, absinthin, matricin, anabsinthin, artabsinolides, artemetin, artabin, arabsin, and so on. The herb is used to treat indigestion, increase the appetite, and soothe gallbladder and liver pains. A strong remedy, known for its diuretic, anti-bacterial, energizing, vermifuge, and aromatic characteristics. The medicine is applied for increasing appetite, treating indigestion and any abnormalities happening in the digestive system, especially those provoked by gallbladder dysfunction. As an herbal remedy used internally wormwood is commonly used as a soothing medical for abdominal pains, especially induced by gastritis, liver dysfunction; and also used to treat anemia, menstrual cycle abnormalities, helminthes infections, hot flashes, meteorism and so on. As an external remedy wormwood is used for soars of different types, wounds, and insect stings. The main purpose of wormwood intake is to improve the functionality of the digestive system, treat its abnormalities and enhance its potential in whole. 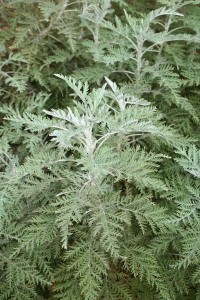 Wormwood is potent of increasing the quantity and content of appetite juice. As a vermifuge it’s especially active in eliminating pinworm and roundworm. Inflammations and bacteria can also be addressed using wormwood. This herb is known to have a general positive effect on the organism. The plant is originally found in Western Asia and Northern Africa, and artificially grown in the US and other countries. The average length of the stem is three feet. The plant is characterized by the abundance of flower parts which gather in panicles. The bracts of round shape have gray color, and are followed by pubescent receptacles of yellow color in ripe condition. The fruit is rather small, being almost 2 mm in length. Chopped plant is applied for infusions, and if it’s turned into powder, tincture, or any kind of solid/liquid forms, the herb is applied as an oral remedy. The herb is usually mixed with other components. For an infusion a cup of boiling water (150 ml) is mixed with a half-teaspoon of the remedy, then left for 10 minutes, filtered, and kept till becoming either warm or cold (beware of using it hot, it can be harmful on your body and produce a strong, even killing effect). Tea is a widely-known form of herb intake used, but it’s recommended to avoid drinking it due to the strong effect the plant produces. The plant is also packed into pills which rid you of feeling its bitter, rough taste. This form is commonly used for killing helminthes. Dosage: You can only take up to 5 g of the plant in form of infusion on a daily basis. The tincture dosage is 20 drops on the average, supplemented with generous water amounts. The liquid remedy should be limited to 1-2 ml for a dose. Airtight packs are best-fitting for storing the remedy, which should also be taken out of direct sunlight. Thujone, contained in the herb, is the main reason why you should carefully follow the instructions of your health-care provider regarding the dosage. The overdose can lead to nervous dysfunctions, headaches, abdominal pains and dizziness. The period of wormwood intake should be limited, as it can pose a threat to one’s health. In some countries the herb is totally prohibited for use due to the negative consequences it can lead to. Absinthe, an alcoholic beverage which was very popular in some European countries in the XIX century, uses wormwood as its core component. Still, recently this plant has been forbidden for use in alcoholic beverages due to the fact that it can cause addiction and ruin one’s health. Warning! You should necessarily contact your health-care provider before applying this plant as part of your treatment or therapy, or using it with any purposes, as any wrong step with its dosage can cause an effect unbearable for your organism.